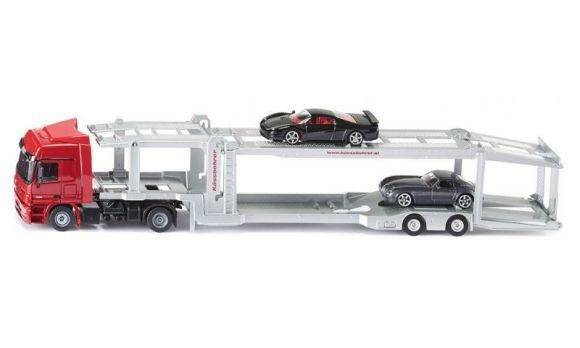 Car transporter with two-axle Mercedes Actros tower and two-axle multi-function trailer. This model is almost entirely produced in die-cast metal and can transport up to eight Siku private cars! The option to fully lower the rear section of the top platform means trucks and tractors from the Super 50 and Farmer 50 series can also be transported. Very well made and hope it will be as sturdy as it looks. It's a present for my grandson and he won't open it until Friday this week. it is all what it is very great indeed.